As the NBA regular season comes to an end, it is still being debated as to who should be voted the League MVP. 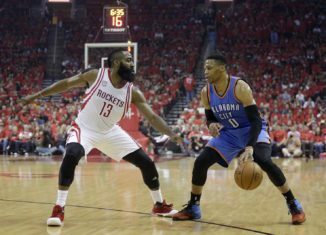 There are three guys who many people feel should be named MVP: Russell Westbrook of the OKC Thunder, James Harden of the Houston Rockets, and Kawhi Leonard of the San Antonio Spurs. Russell Westbrook has been putting up historical numbers in all aspects of the game. Westbrook led the league in triple doubles in the NBA season, averaged a triple-double a game, and broke NBA legend Oscar Robinson’s record of most triple doubles in a eighty-two game season. James Harden is putting up MVP like numbers as well. In the regular season, Harden averaged 29.1 points per game, 8.2 Rebounds per game, and 11.2 assists per game. Not only is this a career year for James Harden, but his play helped the Rockets cap off a very successful regular season as they look to make a run in the playoffs. The play of Kawhi Leonard has not gone unnoticed. Since entering the league in 2011-2012, Kawhi Leonard had his best regular season, averaging 25.5 points, 5.8 rebounds, and 3.5 assists per game. His play has led him to be considered one of the top all around players in the NBA. After the retiring of Tim Duncan, Kawhi knew that he would have to play better and have a bigger role on the team. His career year has helped the Spurs remain a top team in the NBA. With the playoffs starting, these players will need to step up their game in order for their teams to win. After the first round of playoffs, there has only been one upset: the Jazz beating the Clippers. All of the other top seeds made it passed the first round. The Cavaliers and the Warriors seem like the two most dominant teams. Although the Cavs had a rough ending to the season, they have brought their game to the playoffs, and it appears that they will beat the Raptors. The Warriors have also been astounding in the playoffs, and they look like the favorites at this point. Other teams, such as the Celtics, Rockets, and Spurs, have also been performing well. However, the Warriors will be very hard to beat because of the pure talent on the team. The end of the NBA regular season has come with confusion in the standings, and it will be interesting to see the final results.